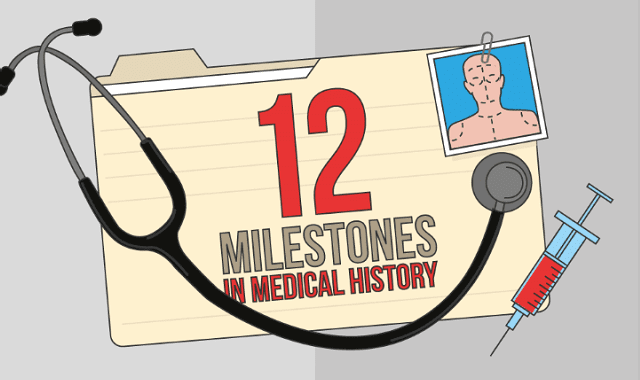 12 Milestones In Medical History #Infographic ~ Visualistan '+g+"
We may sometimes take for granted the amazing things that our doctors and nurses can do for us when we need their help, and we may even forget that the simplest forms of medicines we have today actually took years of trials before they ‘did what they said on the tin’! For forty two years the charity Anthony Nolan has been saving the lives of those who have blood cancer or who have blood disorders. They do so by matching those individuals who are willing to donate their blood stem cells or bone marrow with those in need of them and who are in need of the life saving transplant. They connect three people everyday to a life saving match and conduct world-class research into stem matching and transplants. We have compiled in the infographic some of the greatest milestones in medical history, that have all lead to further incredible medicines, treatments and technologies to be created. From the first ever clinical trial carried out by Dr James Lind, to E. Donnall Thomas’ pioneering work in said field of stem cell transplantation, take a look at some of the greatest medical ‘firsts’!